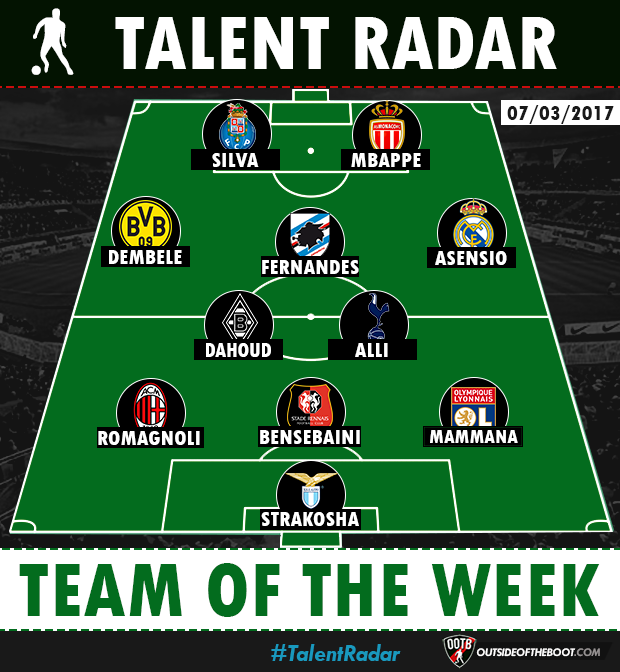 A regular feature on our website is the Talent Radar Team of the Week with the best young players compiled into an XI from across Europe’s top seven leagues. You can read this for all details on Talent Radar, who is eligible under it and what else we publish within this feature. No Champions League football over the course of this week meant that the focus was firmly on the bread and butter that is league football. The La Liga race is hotting up for sure, with Barcelona and Real Madrid playing hot potato with pole position. The Premier League continues to focus its main battles for 4th and survival, while Juventus dropping points wasn’t really beneficial for Roma, as they crashed to defeat to a resurgent Napoli. Defence: A new face between the sticks for this week’s line up, with Thomas Strakosha making his debut on our ToTW. The Albanian stopper makes it in on the back of a clean sheet away at Bologna, having made 3 saves on the way to doing so. The 3 man defence is a star studded one, with some very highly rated players featuring. The stylish Alessio Romagnoli is the first name in defence, after a calm performance to put Milan within 3 points of 4th placed Lazio. The Rossoneri have had a turbulent season, but it’s getting back on track now. Rennes seem to have developed a good habit of featuring at least 1 of the defenders on this team, and this time, it’s Bensebaini’s turn to make it. The Algerian was the star performer for Rennes in a 1-1 draw at Metz, making 4 tackles, 7 interceptions, and 11 clearances. The talented Emanuel Mammana rounds off the defence. The Argentine is close to completing his first season in European football, and there cant be too many complaints about his progress. He got the goal this weekend in the 1-1 draw, and was generally quite imperious at the back, making 9 clearances for his side. Midfield: It’s a stacked midfield this week, with as many as 5 players featuring in our 3-5-2 formation. Starting with the wide areas, we have Marco Asensio on the right wing. It isn’t really much of a revelation to suggest that youngster have a tough time breaking through at Real Madrid. Having said that, Asensio has made more of an impression than most. He got a good goal for himself this weekend, and made the most of the absence of players like C. Ronaldo and Bale. On the other side, we have Ousmane Dembele, a youngster in a very different environment indeed. He was pushed slightly further forward this week, alongside Reus and Aubameyang, and the results were quite spectacular. Dortmund romped to a 6-2 win over Leverkusen, and Dembele scored a goal and an assist. Going forward, Dembele is going to be important to Dortmund, especially with Reus injured now. The midfield triangle feature Bruno Fernandes at the tip. The Sampdoria man had a good weekend, playing a part in all 3 goals that his team scored. He made 2 assists, and scored a goal, as Sampdoria ran out 3-1 winners at home against Pescara. The other 2 members of the midfield are two players that we all know quite well. Mahmoud Dahoud starred in Gladbach’s continued recovery under Hecking, as they coasted to an impressive 4-2 win at home against Schalke. The all action midfielder was on top form, picking up an assist for his side. But more than that, his overall performance really helped Gladbach dominate he middle of the field. 7 tackles by himself, aside from having the ball virtually stuck to his foot when he got it. 90% pass success is very impressive, especially when you consider that about 20% of his passes were long passes. His partner, Dele Alli continues to make great strides forward. He scored his 13th goal of the league season, a crucial one too, considering that Everton managed to get 2 late goals. More important is his partnership with Harry Kane which is keeping Spurs above some of their higher spending rivals in the league. The duo have been on fire since Pochettino shifted to 3 at the back, and probably complete each other’s sentences at this point! Forwards: The forward duo both had tremendous weekends too. Andre Silva, commonly considered the next big thing in Portugal, has been one of the top draws in the Liga NOS this season. He made the most of a dominant Porto win this weekend, getting a brace in the second half as his team coasted to a 7-0 win. Finally, is the customary Monaco presence in the side. Kylian Mbappe has recently shot to fame, especially after his performances in the Champions League. The fame is justified though, with his pace and skill really making him one to watch out for. His team has scored 82 goals in 28 games, and added 4 this weekend. Mbappe got a brace, and Jardim and Co. will be looking to players like him to try and overturn the City applecart when the teams face off again next week. Considering their free scoring attack, I wouldn’t shy away from heading to my betting sites to try and make a quick bonus.